4. a narrow deep western boundary current, as shown in Figures 5.144b and 5.145, which transports the cold bottom water equatorward. The meridional overturning circulation plays the role of a conveyor bringing heat and other important tracers poleward and thus contributing to the machinery of the global circulation and climate. 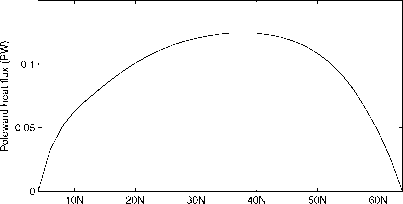 For the present case, the maximal poleward heat flux is about 0.12 PW (Fig. 5.147); a much lower value than that observed in the ocean, since no wind stress force is included in this model. What mechanism is responsible for producing the main thermocline? Fig. 5.146 Meridional overturning streamfunction, in Sv. Fig. 5.147 Poleward heat flux associated with the meridional overturning circulation, as diagnosed from the numerical model. thermal circulation under the same forcing conditions, with the only difference being that one is with wind stress and the other one with no wind stress. Fig. 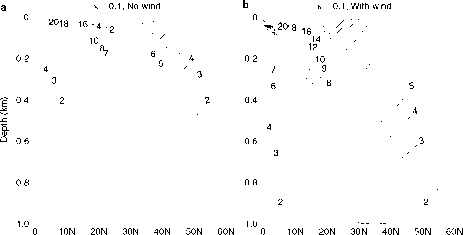 5.148 Temperature distribution along the middle of the basin with a uniform vertical diffusivity of 0.1 x 10-4 m2/s; a without wind stress; b with wind stress. 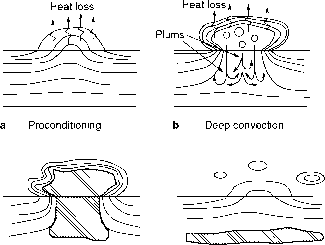 main thermocline in the subsurface region. In fact, the vertical stratification monotonically declines from the sea surface downward to the deep ocean. 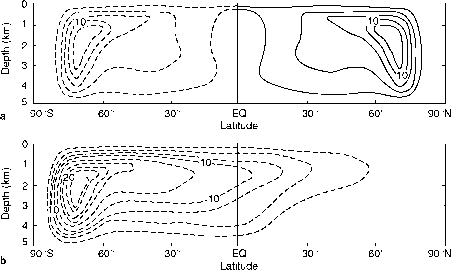 However, when a standard wind stress is applied, including equatorial easterlies, mid-latitude westerlies, and/or high-latitude easterlies, a main thermocline forms at the mid latitudes, around the depth of 400-500 m.
These two cases demonstrate that wind stress is the essential ingredient in the formation of the main thermocline in the subtropical ocean. The physical processes involved in the wind stress working are analyzed as follows. Wind stress drives the Ekman transport in the surface layer; the horizontal convergence of Ekman transport gives rise to Ekman pumping, which pushes the isopycnal layers in the upper ocean downward. Since isopycnal layers in the deep ocean are nearly flat, the bowl-shaped isopycnal layers in the subtropical ocean give rise to a strong subsurface maximum of vertical temperature gradient, i.e., the main thermocline. The first numerical confirmation of thermohaline catastrophe was reported by F. Bryan (1986). At that time it was remarkable to find a solution for the pole-pole circulation. Bryan started with a two-hemisphere model ocean with symmetric forcing and relaxation conditions for both temperature and salinity. A circulation symmetric with respect to the equator was established. In order to find the asymmetric circulation, he tried many things to trigger the collapse of the symmetric circulation, including imposing a large positive salinity anomaly at high latitudes. It turned out that the symmetric circulation is insensitive to such perturbations. However, he found that if a relatively large negative salinity anomaly was imposed at the northern limit of the model ocean, a rapid response of the meridional circulation would take place. The collapse of the circulation is apparently caused by the interruption of deepwater formation at high northern latitudes due to the existence of the new halocline - a freshwater lid over the upper ocean. Since this kind of abrupt change is induced by the halocline, it is now termed the halocline catastrophe. Thermohaline circulation under mixed boundary conditions Early in the numerical modeling of the thermohaline circulation, both temperature and salinity were subject to strong relaxation conditions. 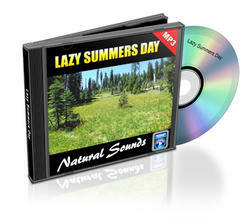 Under such strong relaxation conditions, it was rather difficult to find multiple solutions. The breakthrough took place when people started to try different types of boundary condition. As discussed above, a flux condition applied to the salinity balance is a major ingredient for multiple solutions and catastrophe. In addition, introducing the freshwater anomaly at high latitudes induces the thermohaline catastrophe. Although this newly formed layer of relatively fresher water may be subject to cooling, nevertheless its density cannot be reduced much because, at low temperature, seawater density is insensitive to changes in temperature. Consequently, deepwater formation at this pole is cut off; the interruption of deepwater formation at one pole sends a strong signal to the whole circulation system, and thermohaline catastrophe ensues. With recent advances in numerical modeling, the halocline catastrophe has been reproduced through many different pathways, and in most numerical model experiments such initial impacts may no longer be needed since, in many cases, a model's solutions automatically drift away from the initial quasi-steady state and reach other states. A halocline is defined as a layer where the vertical salinity gradient is locally maximal. Haloclines exist in the world's oceans, mostly as the interface between a layer of low-salinity water on the upper surface and the relatively salty water below. An outstanding permanent halocline exists in the subpolar gyre in the North Pacific Ocean and the Arctic Ocean (Fig. 5.149). Formation of the halocline in these locations is closely related to excess precipitation or local convergence of relatively fresh water in the upper ocean. In addition, a non-permanent halocline can also be developed through various dynamical processes. For example, diurnal heating and rain events may substantially influence the turbulent motions in the upper ocean and lead to the formation of a halocline in the upper ocean (Soloviev andLukas, 1996). A freshwater cap may appear in the subpolar northern North Atlantic Ocean, which may be caused either by the import of freshwater from melting ice or by excessive precipitation over the subpolar basin. A halocline in the upper ocean can substantially cut down the air-sea heat flux, as discussed in Section 5.3.2. For example, a freshwater cap in the northern North Atlantic Ocean is considered as one of the major mechanisms capable of triggering a halocline catastrophe and an abrupt climate change in the Atlantic sector. Fig. 5.149 a, b Halocline in the North Pacific Ocean based on climatology. 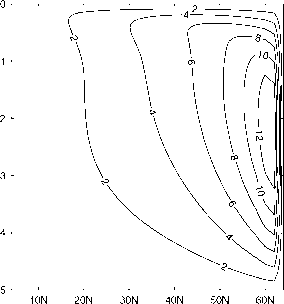 Halocline catastrophe from numerical experiments Using a model for a two-hemisphere sector, including both poles, F. Bryan (1986) carried out the first set of successful numerical experiments demonstrating the idea of the halocline catastrophe. Under relaxation conditions for both temperature and salinity, the model was first run to a quasi-equilibrium of circulation which was symmetric with respect to the equator (Fig. 5.150a). However, when the model was restarted and run under the new mixed boundary conditions, such a symmetric circulation was potentially unstable. In fact, with the addition of negative salinity perturbation, the symmetric circulation became unstable and a polar halocline catastrophe set in. As a result, the symmetric mode of the thermohaline circulation collapsed and an asymmetric pole-pole circulation was established gradually (Fig. 5.150b). Thus, the entire solution changed accordingly, with the strength of the overturning cell in the Southern Hemisphere being nearly doubled. The most important consequence of the halocline catastrophe is that the poleward heat flux is switched from a symmetric mode to an asymmetric mode, as shown in Figure 5.151. The specific asymmetric mode shown in Figure 5.151 suggests that after the halocline sets in, the poleward heat flux in the Northern Hemisphere nearly vanishes. Such a dramatic change in the oceanic poleward heat flux must bring about an abrupt and fundamental change in the climate conditions on Earth. Fig. 5.150 Sketch of the two equilibrium states of an idealized North Atlantic Ocean under symmetric forcing for temperature and salinity (overturning rate in Sv): a the steady state symmetric with respect to the equator; b the asymmetric pole-to-pole mode set up after the halocline catastrophe (redrawn from F. Bryan, 1986).